Kim Waugh Racing Stables :: Around the Money all Day at Taree! Around the Money all Day at Taree! 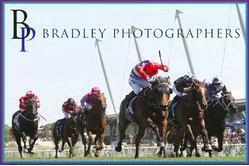 Our 3 stable runners were around the money on Monday at Taree recording a 2nd/3rd and 4th placing! Holy Reign was super resuming off one trial and finishing 2nd to the short priced odds-on favourite in the 1250m maiden whilst Belle De Vega (pictured) continued her great form adding a 3rd placing to her impressive race record of 2 wins and a placing from just the four career starts. Our first starter Merge didn't look entirely comfortable on the soft track when he was let off the bridle to make his run in the home straight but none the less held his ground to finish 4th only beaten just over a length. No doubt he too will show good improvement from the run as he had only trialled once leading into the race. Holy Reign looks the horse to follow and I'm sure it won't be too long before he breaks his maiden!